This is the RDS 70 Gallon Vertical Rectangle Refueling Tank. 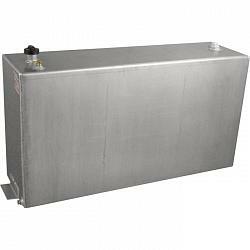 These aluminum tanks are designed for transferring diesel or gasoline from the bed of a pickup to automobiles, heavy equipment, boats, 4-wheelers, generators, or anything else you may have. Enjoy the convenience of a gas station that goes where you go. DOT approved aluminum fuel tanks. Aluminum tanks do not rust, which protects fuel from contamination. Tanks can also be used to gravity feed diesel to supply additional capacity to a factory tank, with the use of an RDS Diesel Install kit. It is the user's responsibility to comply with local, state and federal requirements pertaining to safe transportation, loading and discharging of tank contents. Made in U.S.A. NOTE: This tank is manufactured in a Mill Finish that WILL have scratches on it. These scratches are caused during the manufacturing process and do not effect the integrity of the tank. These tanks are for industrial use and are not meant to be show pieces! Scratches on these tanks are not considered damage and orders cannot be returned based on these scratches.